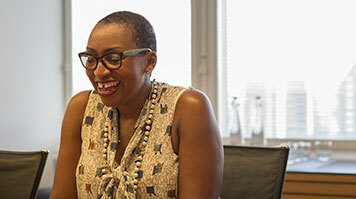 The newest Honorary Doctor to join the LSBU School of Law and Social Sciences is Sandie Okoro. General Counsel and Senior Vice President of the World Bank Group, Sandie is being honoured for her outstanding legal career and her active and consistent commitment to promoting gender diversity. "I think I have the best legal job in the world. The World Bank is a specialised UN agency with the twin aims of ending poverty and boosting shared prosperity. One of the Bank’s nicknames is the “World’s Brain”: I work alongside some of the cleverest people I’ve ever encountered. It’s an international organisation and is truly and deeply diverse. We lend countries money to help with development, but we also share knowledge. Along with economists and my 160-strong legal team, the Bank has people who know how to build road systems and tunnels, how to set up a healthcare system, in fact every aspect of development on the ground. "I was completely shocked when I was approached for this role. I’d never worked in development or done international law. My first reaction was to say ‘No, I couldn’t do that’. But when I thought again, I realised it was a fantastic opportunity and maybe I should let the World Bank decide whether or not I was up to the job. It turns out you can jump from one branch of the law to another, even at senior level. Development has always been a passionate interest of mine, so it’s wonderful to be able to support it in my legal work. "The role of General Counsel at the World Bank is unique. The Bank has its own set of privileges and immunities and is governed by its own internal laws and regulations. It is a constant challenge to protect our immunities and ensure that those laws give us the protection we need, while at the same time enabling us to continue with our development work. "When I was eight, I told my teacher I wanted to be a judge. She replied, ‘Little black girls from Balham don’t grow up to be judges’. I think that sealed my fate: I was completely focused on a career in law from then on. A lot of people tried to discourage me, told me there were barriers for someone like me, advised me to change my ‘ethnic’ name. But I believed (and still do) that the only true barriers to progress are in our heads. If there’s a secret to my success, it’s not about being great academically, it’s about being resilient. It is tough, and you will get knocked down, but the only way to get where you want to be is to get back up and keep going. Last year I was made an Honorary Bencher at Middle Temple. It’s a position reserved for those who have reached the level of a high court judge or above, so I feel I have achieved my childhood ambition. "There’s a portrait of me that was once hung in an exhibition about women in law with the caption, ‘This is what a single mother from Balham looks like’. I wanted that caption because it’s important that people don’t just assume your life is nothing like theirs, that you haven’t had to overcome challenges. I’m a single mother of two, including a daughter who has autism, and I want people to see me and think, she’s stuck at it – and I can too. The job title is not the person; it’s important to bring it down to the level of the individual. So yes, this is what a single mother from Balham looks like. "The thing I’m most proud of is that I’m able to use my status and my voice to promote gender equality and raise issues around gender-based violence at a high level. Because of the career I’ve had, when I speak I am listened to. I recently co-hosted a conference in Tanzania, the first of its kind to cover gender and the judiciary in Sub-Saharan Africa. It was attended by chief justices of many nations, all now intending to weave gender into their policies. The convening power of the Bank means something that starts as a conversation can become an international event. I’m so glad I can be a voice for those who are not otherwise being heard. "Diversity is becoming a reputational issue, and that will really make a difference. I worked in financial institutions in the City of London for years, so I’m very aware of what needs to change. I think people are talking about diversity much more, which is great. But talk needs to be followed up with action, and it’s still too slow. With social media there’s nowhere to hide. The #Oscarssowhite tweet with a single photo was a great example that forced an institution into action to save its reputation. I’m glad to see that the next generation coming through is asking questions about diversity, and I think increasingly a company will live or die by its reputation as much as its balance sheet. Overall, I’m very hopeful that we will see the rate of change increase. "This is a big job, and right now I’m not thinking beyond that. I’ve also learned not to worry too much about what’s next. But if there is something you want, I believe there’s value in just putting it out there and waiting to see what comes back. And it’s always, always good to aim high."